Boulle (pronounced “bool”) refers to decorative inlay, using materials that may include fine strips of brass, tortoiseshell or ivory. It is French in origin and is occasionally spelled with a capital b (although lower case is fine and maybe even preferred). 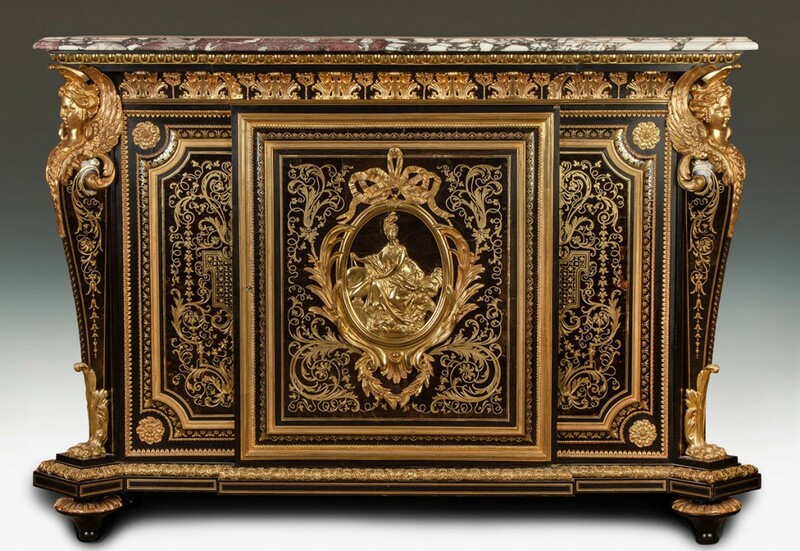 Boulle is named after Andre-Charles Boulle (1642-1732), the French cabinetmaker who is generally regarded as the preeminent artist in the field of marquetry. He has even been described as "the most remarkable of all French cabinetmakers,” no easy feat considering the stiff competition he faced back then. The piece shown here is a fine and rare boulle cabinet from the 19th century. It is being offered in Cottone Auctions' Fine Art & Antiques Auction, slated for September 23-24 at the firm's gallery in Geneseo, N.Y. The cabinet, in all original condition, was pulled from a private estate in Rochester, N.Y. It boasts winged women, claw feet, acanthus mounts and a marble top. It is 49 inches tall by 70 inches wide and has a pre-sale estimate is $7,000-$10,000. It is one of several boulle pieces in the sale. All are expected to do well. Visit www.cottoneauctions.com.